The grapes are mainly coming from old Syrah vines in Mauves, the heart of Saint Joseph, and St Jean de Muzols. "Vin de Mauves" was actually the historical name of the whole wine region. St-Jean-de-MuzolMauves. 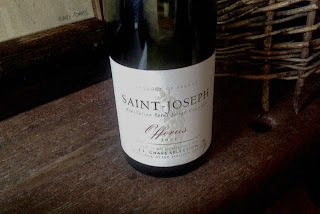 "Vin de Mauves" was actually the original name for Saint Joseph. A "hun warrior" aromas of iron, blood, smoke, grilled meat with forest berries and damp earth. Lively, yet quite silky and smooth on the palate. Ripe blueberries and plums with a good amount of gaminess. Also some peppery olive tapenade with Herbes de Provence. Decent tannins and acidity. Surprising sweetness in the finish, almost like a lingonberry jam. Nice length. Poised and elegant Northern Rhone Syrah. Good value (at least in Northern Rhone standards).